AP Teachers Transfers Chittoor District Teachers Transfers 2017 Transfer Orders Download @ cse.ap.gov.in, Transfers School Allotment Order Copies , School wise,Mandal Wise,Division wise,Subject wise,Cadre wise,Medium Wise,Management Wise,District Wise AP Teachers Transfers Order Copies will be available from 30-7-2017: School wise,Mandal Wise,Division wise,Subject wise,Cadre wise,Medium Wise,Management Wise,District Wise AP Teachers Transfers Order Copies will be available from 30-7-2017. DEO Chittoor District AP Teachers Transfers Tentative Seniority list for Manual counselling , DEO Chittoor, Chittoor District AP Teachers Transfers Seniority List, Manual counselling revised schedule, Vacancies List, Manual counselling arising vacancies, Long standing vacancies, 8 years vacancies, retirement vacancies , clear vacancies details, Entitlement Points transfer orders details at at http://deochittoor.org/ AP Teachers Transfers 2017. DEO CHITTOOR Online Application AP Teachers Transfers DEO Chittoor teachers transfers 2017 Provisional list , DEO Chittoor teachers Promotions Certificate Verification List, Provisional list. 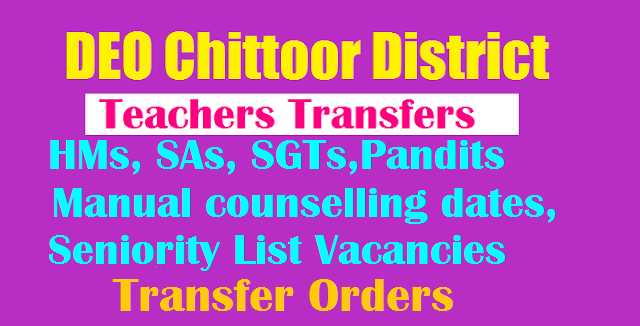 DEO Chittoor SGT Seniority List Download, DEO Chittoor Teachers Transfers, Rationalization, Vacancy 2017-18. DEO Chittoor Dist Vacancies Promotions, Teachers Transfers 2017, Seniority List, Retirements, Schedules Schools Calendar 2017-2018 at Official Website http://deochittoor.org/ All the details Shown In below Online Mock Application 2017 AP Teachers Transfers 2017 . AP Teachers Regulation of Transfers Rules Guidelines 2017, Rationalisation , Ap High Schools Norms Child Ratio Guidelines 2017, DEO Chittoor Dist Vacancies Promotions Transfer 2017. DEO Chittoor Dist Vacancies Promotions, Teachers Transfers 2017, Seniority List, Retirements, Schedules Schools Calendar 2017-2018 Teachers Transfers Seniority List, Manual counselling revised schedule, Vacancies List, Manual counselling arising vacancies, Long standing vacancies, 8 years vacancies, retirement vacancies , clear vacancies details, Entitlement Points transfer orders at Official Website http://deochittoor.org/ All the details Shown below. Andhra Pradesh Government School Education Department conducted AP Teachers Transfers of HM, SGT, SA,PET, Language Pandits of district.The teahcers who are transfer get transfer order copy from CSEAP web site and Join allotted New schools 01-08-2017. Please submit objections, if any, on tentative seniority list before 5 PM on 20-07-17. Mannual Applications will not be entertained Seniority list will be displayed once the confirmation given by the concerned DEO. DEO Chittoor Transfers Vacancies List 2017 has already been published at available for download. Rationalization List, Model Schools List, Category 4 places lists have already been added. Teaches can download Chittoor district teachers management wise, category wise Transfers Seniority List and Vacancies List from the official website. Chittoor District (SGT/SA/TPT/HPT/PET...etc) seniority list now in online at deoChittoor.50webs.com, Annexed to the Procds of the District Educational Officer(FAC), SPSR Chittoor District, so all the Zilla Parishad High School (ZP), Gov. MPPS all the schools SGT Teachers can check this DEO Chittoor SGT Provisional Seniority list. you have any objections on this informed to your MEO After completion of objections and verification this Chittoor SGT Provisional Seniority list will be send to DEO office.